Do you need help setting up e-mail on your device? You need the password of the account in order to set up e-mail. If you do not know your password, you can request it from your e-mail provider. 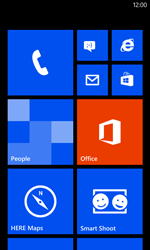 For instructions on how to setup e-mail on your Nokia Lumia 520, see the information below. Do you need help setting up MMS on your device? This requires the correct APN to be configured. See the below instructions. Turn your Nokia Lumia 520 off, reboot it and check whether the problem has been solved. Did you check your mobile internet connection? If there are problems with mobile internet, that could be the cause of problems with other services, such as e-mail. Open your mobile browser and try to load http://corner.base.be, for example. If this fails, refer to the instructions below for the correct configuration of mobile internet. Did you check your e-mail settings? If you receive error messages when using e-mail, there may be something wrong with the account settings. Check if this problem can be resolved by resetting the account. What to do if the internet and e-mail settings are correct? If the mobile internet works and you have followed the instructions for setting up e-mail, but you still get error messages, this may be to do with the services of your e-mail provider. We would advise you to contact your e-mail provider for additional support in that case.